Who wants to even USE the kitchen when it's a total hot mess disaster zone?? You walk in your kitchen with every intention to cook. You see the mess. You walk right back out and call for pizza delivery. OH, THE GUILT. But what if it didn't have to be that way?? What if you learned how to declutter your kitchen and KEEP it clean? How much money would you SAVE eating at home?? Taking simple steps to declutter your kitchen is HUGELY helpful if you’re working to save money by avoiding the drive-thru and cooking at home. 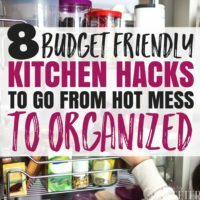 But I know figuring out HOW to declutter your kitchen is a bit daunting, especially if your kitchen’s in serious disarray. I’m going to give you the steps you need to get you started. If you’re cutting back on expenses, cooking at home more often is a great place to start. You don’t need to cook every meal at home, of course, but even if you eat out HALF as often you’ll save a bundle. But yea, no one likes to cook in a cluttered kitchen. It's demotivating and frankly, a pain to sort through kitchen cabinets looking for ingredients and tools. Plus, a disorganized kitchen is wasteful. You’ll end up forgetting food until way past the point of no return. I’m a bit of a food safety freak so I avoid using ingredients past the “use by” date. This means if an item gets lost in the back of a cupboard, it’s out. The AMAZING thing about decluttering your kitchen? Once you start, cooking becomes much easier! 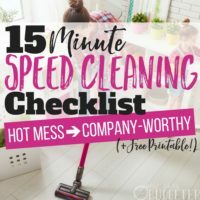 Even if you do make-ahead meals and most of your major cooking on the weekends, having a clean, organized workspace will save you major time and stress. So if you’re looking at the disaster zone that is your kitchen, get ready! I’m going to walk you through how to declutter your kitchen, step-by-step until you go from a disaster zone to dinner-ready kitchen! Let’s go! The first step to declutter your kitchen is to literally clean out everything! This is where you get a big garbage bag and start mercilessly tossing out anything expired, old or that you’ll never eat. Clean like you’re planning to move out! I want you to check every expiration date. If it’s expired, throw it out! Most food is only good a week or two after opening (it will indicate on the label). Follow the guidelines. When in doubt, throw it out! Go through every item in your fridge, freezer and cabinets. If you find food that’s still good but you know you won’t eat it, either donate it or toss it. If you choose to donate the food, I want you to know WHERE you plan to donate it before you save it. Many foodbanks will only take certain foods. Plus, they must be shelf stable. I know it feels bad to throw out food, but once you’re organized, you'll never go through this again. Run your dishwasher when you start the process, so nothing gets missed as you clean out. Wash anything dirty from the cabinets. As you go through and declutter your kitchen cabinets, even if you don’t pare down to fewer dishes, do yourself a favor and donate or sell any small appliances and gadgets you don’t use or need. So many kitchen gadgets are one-trick ponies—they only do one task. These items clutter up your drawers and cabinets. Small appliances eat space on your countertops. It’s great if you own a huge kitchen with plenty of room for your grill, panini press, waffle maker, espresso machine and more. However, if your kitchen space is at a premium, you literally need only a few appliances to get by. Sort through and DONATE any dishes, appliances or tools you haven’t used in the last six months. You might store stuff in your kitchen you don’t use often or at all—like old wedding gifts, small appliances that don’t fit your cooking style, decorative dishes or items you rarely use. Clean them out, donate them, sell them or give them away! Give them a new life with someone who will actually use them, as opposed to cluttering up your kitchen! If you find very seasonal items (a turkey platter or Christmas dish) keep them only if there’s plenty of space to store them and ONLY you plan to use them EVERY year. If you don’t, give them a new home by donating them to a second-hand store. We use our griddle frequently and our slow cooker. If you love baking, maybe you use your mixer often or your toaster oven. Pick one or two appliances you use the most often and declutter your kitchen by getting rid of the rest. If you can’t bear the thought of life without your ice cream maker or your bread proofing machine, put them in your garage or basement for a while. If six months or a year pass by without any use…it’s safe to part ways. Most kitchen tasks can be completed with little more than a knife, cutting board and a spatula. Simplify and your kitchen will feel easier to navigate, more accessible and easier to use. You’ll enjoy cooking in an organized kitchen and it will stay clean much more easily. If you’ve got a small space and you're struggling with how to declutter your kitchen, I want you to consider cutting back on dishes. Realistically, what do you ACTUALLY need? A plate, a bowl, a fork, spoon and cup for each person in your family. That’s it. Maybe you dream of hosting an amazing dinner party or planning an elaborate meal. If you haven’t had a party up to this point, get your kitchen under control first. If family and friends come over for a meal, you can always serve them on paper plates and disposable goods. Realistically you only need a few tools to cook—a pot, a frying/sauté pan and a baking dish. Buy tinfoil baking dishes that are easily recycled or tossed after you use them. It’s not the most economical way to cook, but if a messy kitchen is keeping you from eating at home, opt for disposable options until you get your organizational skills and habits under control. Make it easy! Having fewer dishes will force you to keep them clean. You'll always wash your dishes because they’re the only ones you own! Now that you’ve cleaned out, organize the remaining items easily back into your newly decluttered kitchen cabinets. If you need to, purchase or thrift some cool kitchen organization tools, like a drop down spice rack, a lazy Susan to help you get at the items in the back, and/or bins and other organizational tools to keep your cabinets clean and accessible. One of the biggest tricks to keeping your kitchen organized is to keep up on your dishes. I’ve found washing dishes is the single most important task for keeping your house clean and organized. When you do dishes each day, you'll never get behind. You’ll never get stuck with a sink full of smelly, nasty, crusty dishes. It's awesome, you guys. Wash each dish immediately after using it. If you own a dishwasher, put them in right away. If you don’t, clean them with a dish wand as you go. If you find certain items you don’t use frequently and cabinet space is a little snug (as in, you have a tiny kitchen), you may want to put them in a bin and store these less-used items in your pantry or another storage spot. This might include items like baking tools, a mixer, and other tools you use a few times per year. For each item, do a gut-check and ask yourself if it’s REALLY an appliance or tool you are going to use again regularly. This step is key when working to declutter your kitchen, especially if you live in a house or apartment with a small kitchen. 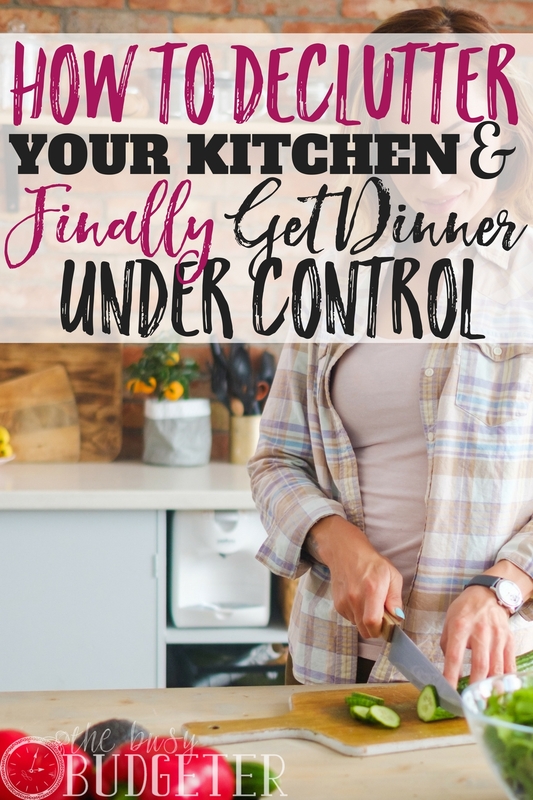 After you’ve gone through the work to declutter your kitchen, it’s so important you never let it get out of control again. Set up a reminder to clean out regularly and schedule kitchen organizing as part of your routine. Stay up on dishes each day. After each meal, wash, rinse, dry and put away every single dish. Believe me—it takes five minutes to wash your dishes up after you eat. And it takes HOURS to tackle a sink full of baked-on, caked-on dishes. Washing dishes should become a regular habit. Put a reminder on your calendar and get in a weekly routine of cleaning out your fridge. Don’t ever keep any leftovers in your fridge beyond a week point (most are only good for a few days). Look at produce and get rid of any item wilting or past its prime. Cleaning out the fridge takes a few minutes, but will keep the job from becoming overwhelming and gross later. Once a month, set a reminder to take 15-20 minutes to declutter your kitchen cabinets. If you organize them regularly, it literally takes a couple minutes to glance through and toss out old ingredients. Straighten up dishes, stack pots, pans and storage items. 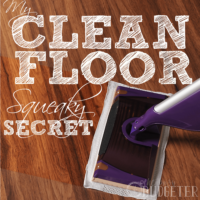 Clean up any areas of the kitchen that are getting unruly or disorganized. There are two ways to grocery shop—multiple times a week, or going only 1 or 2 times per week (on longer trips). 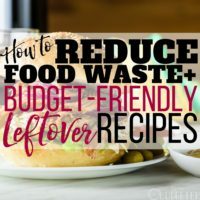 The fewer trips you take, the less you’ll spend, the easier you’ll stick to your budget, and the less wasted ingredients you’ll face. If you go to the store frequently, set a goal of going once or twice a week (or even less). When you visit the store, only buy fresh what you'll eat during the time until your next trip. Don’t overbuy and be honest with yourself about what you’re going to cook and eat. Never shop hungry! It’s tempting to really go nuts in the produce section, telling yourself you’re going to go on a salad kick or start eating only fresh vegetables all the time. Stay realistic. If you aren’t a salad fan, don’t buy tons of ingredients for salads. Buy what you’ll eat. Even opt for smaller packages, because you aren’t saving money if half the package spoils before you enjoy it. The best path to success at the grocery store is to formulate a plan and a list. If you go in with a list and a plan, you’ll know what to buy, how much to buy and what you’re going to do with it. You’ll save money because you won’t simply buy on impulse. If the thought of planning out weeks of meals seems daunting or overwhelming, let me tell you—meal planning will change your life. When you plan your meals, you'll know what you need to buy at the store. You won’t end up with a fridge full of failed meals and expired ingredients because you’ll have a plan. If you’ve never meal-planned, I promise it’s not as hard as you might think. Simply jot down a list of your favorite make-at-home meals. If you only know how to cook a few dishes, it’s totally okay—put them on your list. If you like Hamburger Helper and instant meal kits, put those on your list. If you love frozen pizza, write it down! The idea with meal planning is to figure out what you like to eat and then plot your plan out on a calendar a week or two in advance. If you know you’re going to fix tacos on Tuesday, spaghetti on Wednesday and sloppy joes on Thursday, then you know you need to get ground beef, tomato sauce, buns, pasta, cheese and taco shells. It’s that simple. As you get more comfortable with meal planning, start to branch out to different types of meal plans and methods. Plan meals with extra servings so you can freeze your leftovers and enjoy them for lunch or future dinners (rather than letting them die in the fridge). Prepare freezer meals, planning weeks in advance and cooking one time for an entire month! Meal planning will keep your kitchen organized and help you find cooking success at home! It’s a great idea to plan a few instant and easy dinner options to keep on hand and ready for those days when you don’t feel like cooking. Some days go wrong—you’re running late at work, your car had a problem on the way home, you forgot to move dinner from the freezer to the fridge. On those nights, you need a plan B option ready to go. If you’ve stored a bunch of stuff in your kitchen you never eat (a box of stuffing, a jar of olives, cans of soup), chances are you probably were TRYING to set yourself up for success by having backup foods on hand. The problem is, without intentionally planning out meals, you might end up with a cupboard full of condiments and nothing to actually eat. Instead, plan a few intentional, EASY back up dishes. This might be tunafish, crackers and bag of frozen peas. It might be pasta, a jar of olives, Italian dressing and a can of sundried tomatoes. It might just be PB&J and saltines. Keep a few frozen, instant meals on hand too. If you love a certain type of easy frozen dinner—heck, even pizza rolls, keep them on hand. You probably aren’t going to eat them every night, but once in a while they might come in handy. Keep ingredients on hand, but create a plan for them. As for the random can of cranberry sauce or baked beans—if you’re not going to eat it or use it within the next month, donate or toss it out! With these simple steps, you can learn how to declutter your kitchen, so you'll be ready to go from disaster zone to cooking-friendly space in no time! So, what are your must-have items in the kitchen? How do you declutter YOUR kitchen? You’re so right! Working in any sort of cluttered space is difficult. Plus, I don’t particularly like cooking so any little thing will turn me off doing it. When everything is easy to find, the process goes a lot faster and I’m all about that! Help your family to put things back where they found them by attaching labels to shelves, baskets or whatever. Just make it easy. Then, no-one has the excuse that they couldn’t remember where things go. Your kitchen has a much better chance of staying organized. So agree with the Plan B meals! We buy at least two per fortnightly shop so we have a fallback when work runs late or we just aren’t up to making what we had planned for whatever reason. They have to be something we can make in under 15 minutes and is little more than heating and eating! Katie@MySweetHomeLife recently posted…Simple, practical ways to show appreciation. Great idea to have a Plan B. Things do not always go as planned and it is great to have another option besides eating out. Thanks! A place for everything, and everything in its place! Plan B is my secret weapon. When I make certain dishes (casseroles, etc), I make extra. It doesn’t really take any extra work or time, but it save HUGE amounts of time when I need a quick Plan B! This is on my to do list now!! I am a canned food hoarder, which I use most of for freezer cooking, but I know I have many I won’t use and a lot of ingredients I used for 1 recipe and will never use again. And the appliances are definitely too much – I have an ice cream maker and bread machine that have both been used once. I think I will put them in the garage for now, and see if I use them this year. This goes along with planning meals and finding your grocery shopping style. Click list at Kingsoopers is awesome! Not sure if you’ve heard of it but, you order everything online and drive to the store and they load your car with your groceries. They do charge $5 for this service but my wife and I found that we spend around $50 less per trip by buying online versus going in the store. This way we come up with meal ideas at home, then order the food and go pick it up the next day. Super awesome and time saving. I totally agree! – My main way of making things easier is to have less – that way it’s less overwhelming to find things to eat and ways to cook it. I much prefer to have less choice as it seems to make for more creativity! Here is a good post about a kitchen.All points keep in mind if you manage your kitchen. If you working woman or girl it is helpful. Very correct! as I read your article, I thought these tips should be applied in every room of our house and not just kitchen, as we keep lots of old trash accumulated, not throwing them out of stupid sentimental reasons or just no reason. But once you gather some courage to do it and look at your spacious kitchen or any room for that matter, it gives great satisfaction. Great thoughts, thank you for the share. We really benefited from #7. When we finally started PLANNING our meals out, we were able to stick to it far far better. We saved money, and sticking to our meal plan wasn’t as hard as we thought. Great tips, thanks! I say really it’s a great information. That’s enough. Thank you for shear it. Your tip is all very important and informative. Thanks for sharing a nice blog. You got me when you said that it is demotivating and pain to sort through kitchen cabinets looking for ingredients and tools. Since you suggested decluttering a kitchen to make cooking easier, my personal suggestion is to hire a junk removal service a day before cleaning. Doing this will help save time and energy when clearing it out in order to get a great kitchen faster. Thank you for all of these wonderful, actionable steps on how to declutter the kitchen. I for one really need to start implementing these soon.